As I grew older, these dreams became less frequent. Sadly, it’s been a few years since I last had one of these dreams, at least that I can remember. But in another way, I’m living this dream every day since I was diagnosed with Parkinson’s Disease, especially when I try to run. Did my brain already know what lie ahead for me in the future? I find it intriguing that although I can’t fly, I do need to remember to swing my arms (especially the right arm) when running or walking. Over the course of my life, I’ve been an occasional runner/jogger. I enjoy clearing my mind and taking in deep breaths of fresh air. It seems that every few years, I’d take up running, but there was never enough time in my schedule. Back when I was nearing 40, I did manage to get myself into shape, and ran 2 marathons and 2 half marathons. Weighing in at over 200 pounds, I was never a very fast runner, but there is a sense of accomplishment in completing this type of endurance challenge. I knew the best way to fight PD was to exercise. 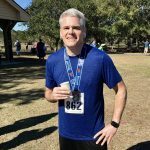 As I worked with a personal trainer to shed those 50 pounds and improve my fitness…in the back of my mind, I wondered…could I get myself to a point where I could run a half marathon again? This was a goal that I pretty much kept to myself. I didn’t really discuss it with either of my trainers…in large part because I didn’t think it was realistic. 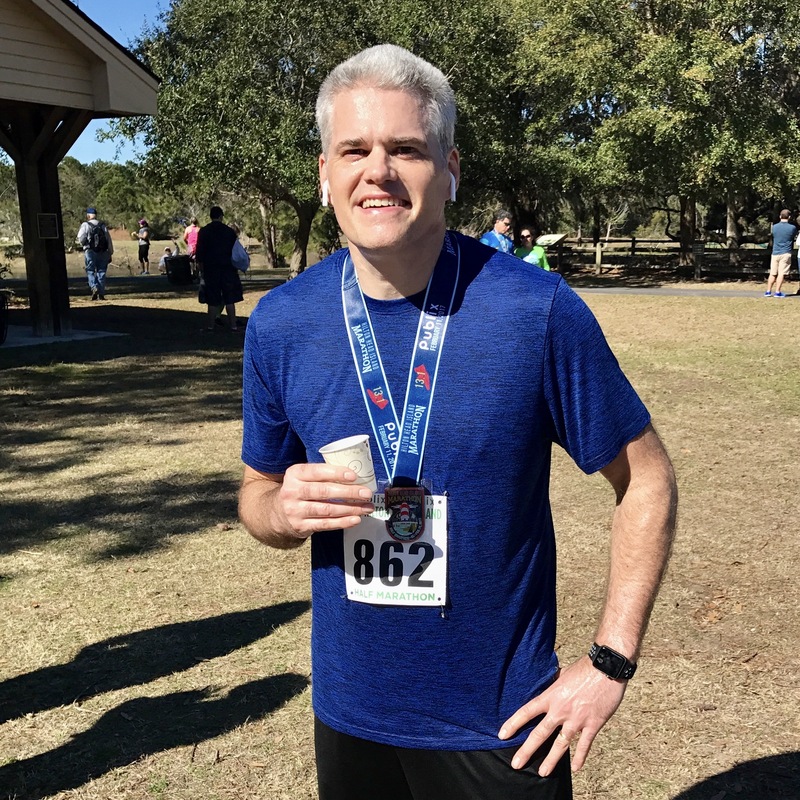 To make a long story short, on February 11, 2017, almost 3 years after my Parkinson’s Disease diagnosis, that mission was accomplished with a half marathon on Hilton Head Island. I may have been 55 minutes slower than I was 10+ years ago, but I can attribute some of that to age. Certainly, PD slows me down, but it’s not going to stop me. As I kicked it into high gear for the last quarter mile and a strong finish, I was already starting to think of how I could train for a faster time next year. Take that PD! Good on you. I,too have Parkinson’s yet still continue to run. I am into my fifth year with the disease and definitely attribute my good health in spite of Parkinson’s to my daily exercise. Keep on keepin’ on! I have had PD for 8 years now. I was a avid runner but PD has made it impossible for me to run. My legs just won’t move the right way and I stumbell and have fallen. Dose anyone know of a assist device that you use while running that will help mantain stability. Some trail runners like to use running poles to improve stability when running on uneven trails. They are somewhat similar in appearance to ski poles. Do a Google search for running poles, and you’ll find some interesting information and videos. There are several websites, like https://www.parkinsons.org.uk/information-and-support/your-magazine/nordic-walking-and-parkinsons, which talk about Nordic walking poles to help facilitate fast walking with PD. Since we typically have arm swing issues, I do wonder whether this may present a bigger issue with the poles, especially sustaining the arm swing motion to use the poles to run distance. I’d be curious to hear if anyone with PD has tried running poles, or has other ideas / suggestions.